Here’s a link to the old thread if anyone is looking for information from it. I suggest you put a link to the old thread so that people can have the info handy. Iron Man, why are you posting in here? I’ve seen the same kind of posts from you in the other thread, why do you and Spanish Dude find it so hard to keep out of these threads if you’re not interested, just stop posting in them. Hey, hey, careful Dogstar. I only posted today in the fücking Whitfield thread. If your not interested in whitfield one bit why do you have to post in the threads, i understand your skeptical of his claims but you could keep your comments civilised? rather than resorting to trash talk. Just let the interested parties, actually curious about his treatments discuss him, they’re all grown ups, they can make thier own minds up about whitfield. i posted this in the old thread but for the benefit of the new thread i will post again. trx2 have stated scientific literature will be provided with the upcoming update (which im guessing will hopefully be sometime sepetember) theyve also stated detailed info on thier upcoming product will also be given in the update as well as product availability. » comments civilised? rather than resorting to trash talk. » the update as well as product availability. Thanks for that, if it is a snake oil it will become evident very quickly when they show us this update, until then I don’t think anyone should be jumping to conclusions based on nothing. » jumping to conclusions based on nothing. Hahaha! How naive you are. Things are not so easy in the tricky world of Hair-Loss. Charlatans are astute. They learn the state of the art, and act as if they were at the forefront. I am sure Whitfield will try to appear legit, and most of people will be thrilled. In fact, we have Gho as perfect example of charlatan, who survives after 10 years of promises. As he never engages independent clinical trials, its not easy for the dummies to realize of the truth. » were at the forefront. » not easy for the dummies to realize of the truth. Spanish Dude, you’re the one who wanted a new thread started because the old one had become cluttered, the reason the old one was cluttered is because people who keep saying he’s a charlatan are obsessed with him and won’t stop posting the same kind of thing again and again, we are not children on here and I’m sure the majority of us are well aware of the tricks snake oil salesmen use. From the very beginning of the old thread I’ve said I’m interested in hearing what he’s got to say and then if they claim to have something we will want proof that it works, I wouldn’t spend a penny on anything until there is conclusive proof of it’s effectiveness, and I’m not talking about vague photos with different lighting showing nothing much at all. We know the tricks that are used and we don’t need repeatedly telling. The simple fact at the moment is we don’t know what they have, it could very well be another snake oil and if it is a snake oil then I’m certain we’ll all spread the word about what a bunch of con artists they are and discredit them completely, that’s one of the benefits we have with the internet. It would be one thing if his jokes were funny but even that isn’t the case. If this keep up, hairsite needs to bring out the wacking stick and start banning a few people. What is here “fact” ? Did you crippled, retarded idiot ever, again, EVER posted ANY “facts” on HairSite ??? “Recently” means “recently”. So in 2008, Whitfield became interested for the topic “hair loss”. That means, before 2008, he has NOT been interested in this topic. This means, this guy had absolutely NO CLUE to “hair research” related approaches in 2008. Nothing, narda (he himself is saying this in the video!) – besides the FACT, that he has been heavily involved in his “Miomi” project as well as in his “biochemistry” studies at Oxford, which means, he didn’t even had the intention and time for any “hair loss researches” in 2008. 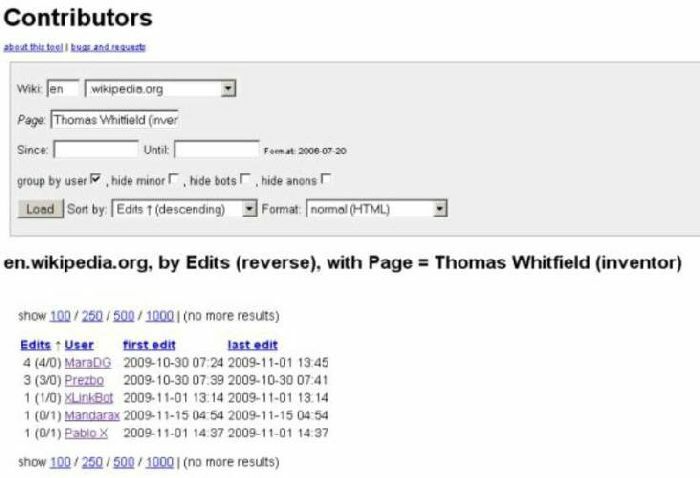 As you can see, “somebody” wrote in 2009 (12 month later), that Whitfield is the holder of more than a dozen patents, issued or pending, and is the author of multiple peer-reviewed publications. No, not 1 or 2 peer-reviewed publications – MULTIPLE peer-revied publications! Right! Where are the “issued” (dozen) patentS ? In the meanwhile, nobody (including myself) could find not even 1 !! Right! Where are the “multiple peer-reviewed” publicationS (plural) ??? Besides that, what the hell does it mean he “is an internationally recognized expert in ion channel research and the molecular mechanism of Androgenetic Alopecia” ??? Really? Within 2 years an int. recognized expert? To be an int. recognized and “respected expert” (besides his “Androgenetic Alopecia” crap), practically, there is a NEED for any published research papers, to be “recognized”! But, where the hell are “recognized” papers ??? “Winner of Idea Idol” ? Whitfield himself said this in an interview, that he (they) wasn’t the winner!! presstige: So you won the competition? And regarding the “Whatever it takes” thingy, under the line, these idiots got NOTHING! So even Whitfield’s claim, that he has been the winner of the “Idea Idiol” competition, is definitely a LIE ! And until today, nothing has changed: Thomas Withfield is definitely, IN FACT, a so called “charlatan”. Nothing more, nothing less. Everybody is easy able to verify the these FACTS - EVERYBODY! 1998: On April 15, “de Gelderlander”, considered to be a normal, serious newspaper in the Netherlands, reported about the physician and researcher “Dr. Coen Gho” and his researches and findings in “hair follicle cell multiplication research”. After that, within weeks, month and following years, researchers around the world in this specific field became aware about “Dr. Gho in the Netherlands” and his work (myself too). In this article, the journalist mentioned, that “he recently (1997/98) patented his approaches for hair multiplication”. TODAY, it doesn’t matter WHERE and WHEN this „hair follicle multiplication“ journey found its end (if at all); what counts is, that he shared his research and findings (through presentations, publications, patents etc) with other scientists and researchers. Shared Dr. Coen Gho his research and findings (through presentations, publications, patents etc) since the very early days with other scientists and researchers? As you can see, until today - DEFINITELY! For instance, Dr. Colin JAHODA, is a well-known and respected hair scientist & researcher, like Dr. Coen Gho. But what did the scientist and researcher Dr. Colin JAHODA for the hair loss sufferers ? So where is this “cure” for hair loss by Dr. Jahoda and Dr. Oliver, as mentioned in this patent ??? I think you know what I mean (or not). guys like YOU, are just completely crippled, retarded, sick idiots. Go out of this board and fück the next hairy dog on the street! Thanks for posting the video of Whitfield, Iron. If that doesn’t confirm that this kid is a complete joke, and this is nothing more than a side project for him, then not much else will. As i’ve stated repeatedly, there is no evidence to back up the claims that he is making on his website. He is a self proclaimed “expert” on hairloss, yet there are no publications, no talks, nothing. It’s a farce, at best. You don’t become a world renowned expert in anything without years of work and contributions. He has none. You ask non-believers to stay out of this thread, Gutted. I wonder why? The reason many of the smart posters on this thread will not stay out and let this nonsense slide is that if they do, it opens the window and makes permissible, the claims of any hack out there. This type of sh*t should be shamed. He is an opportunist attempting to make money off other peoples misery. I can’t think of a lower form of life. I still think Thomas Whitfield’s cooking Meth. Having said that, fall’s just around the corner, and he did, personally, promise to update us by than, so I’m willing to wait. I dont get it guys, i said exactly those things months before that Whitfield is just a sick oppotunist fück and everybody was all over me. Typical typical, but hey story of my life. Anyways, whoever believes in Whitfield has more problems then just hairs, this guy is the poster child for sc*m in Websters Dictionary. Holy crap let me think this true, let us assume ARI and Histogen would want us to pay fees to get informed, i bet gutted and SPanish Dude would be all over this thing like maggots on a big steamy pile of dog sh*t.
I can tell you what whitfield is, he knows that ari and histogen are on the run and will provide amazing breakthroughs and one stop solutions. So he will wait for them to enter market, use their technology, reproduce it (cause his university will pay for this its SCIENCE) and then sell it. End of story. » I still think Thomas Whitfield’s cooking Meth. » promise to update us by than, so I’m willing to wait. Thanks for the insults, please keep them coming. They prove you are very angry, and I am happy of it. No discussion about Whitfield. I totally agree with you. voilà, there you have, some scientific backing. and if Tomas Whitfield drops a few names of researchers in the concoction, there you have, more credibility. Creating credibility is easy nowadays. Creating results is another different matter. Regarding Jahoda, and ARI, don’t compare them with Gho. Jahoda did some research, but afaik, never sold any treatment. ARI is doing trials, but still has not sold their treatments, and they are not resorting to bait and switch tactics afaik. Gho IS SELLING HIS procedure. In the last 10 years Gho has been selling his hair multiplication methods, without conclusive proof!! I think this is a clear charlatan, who sells a non-proven technique. Hitzig is another example of charlatan who has survived over the years, making extraordinary claims without extraordinary evidence, and I think he has also been selling his hypes. » » not easy for the dummies to realize of the truth. » What is here “fact” ? » the author of multiple peer-reviewed publications. » Right! Where are the “issued” (dozen) patentS ? » In the meanwhile, nobody (including myself) could find not even 1 !! » Right! Where are the “multiple peer-reviewed” publicationS (plural) ??? » Really? Within 2 years an int. recognized expert? » “Winner of Idea Idol” ? » This is completely untrue! » presstige: So you won the competition? 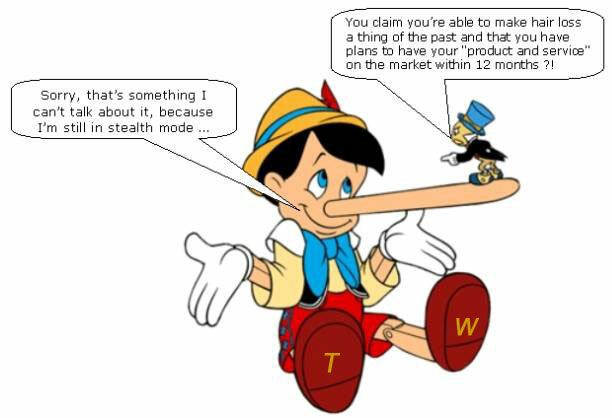 » competition, is definitely a LIE ! » easy able to verify the these FACTS - EVERYBODY! » Where is this patent? » patents etc) with other scientists and researchers. » and researchers? As you can see, until today - DEFINITELY! » scientist & researcher, like Dr. Coen Gho. » mentioned in this patent ??? » I think you know what I mean (or not). » Go out of this board and fück the next hairy dog on the street! » I totally agree with you. What cares me if a completely crippled, retarded sick idiot agree with me ?? But again, PLEASE, show me just 1 single proof, where Dr. Coen Gho “promised” you for you ugly and retarded NW-7 head (more accurate big cyst?) a “full head of hair” ?? Back in the late 90’s - I can’t find anything too, we he promised anything! So where are YOUR facts ??? WHERE ? Since how many years just bla bla bla bla BS crap by the completely crippled, retarded sick idiot Spanish Dude here on HairSite ? Guys, tell me, how many Spanish Dude ugly bald NW-7 years ? BTW - Did YOU fücked the dog or did THE DOG fücked you in the meanwhile, you crippled, retarded sick idiot ? This HS joker Spanish Dude has absolutely NOTHING to say, besides his bla bla bla – no facts paroles, no NOTHING! Go out here, you useless joker! » expert in anything without years of work and contributions. He has none. » You ask non-believers to stay out of this thread, Gutted. I wonder why? » misery. I can’t think of a lower form of life. i ask because of the stupid, same, annoying posts these people come out with, like i said, their are a few people who are interested in trx2 who should have the freedom of discussing whoever they wish on this board. there is nothing more to discuss regarding trx2 until the update, which is soon. you dont need to repeat it. dont you have better topics to dicuss like gho, aderans etc? leave this thread, there will be no more discussion on him until the update. » there is nothing more to discuss regarding trx2 until the update, which is soon. i wont unless new information comes to light from them, which i doubt. Theyve already given us all the information they possibly can give us via emails as of now, the big info is coming in thier update. so leave it alone, no more discussion on thomas whitfield.